The British chain remains the largest in Ireland, but is losing market share to newcomers like Aldi and Lidl. 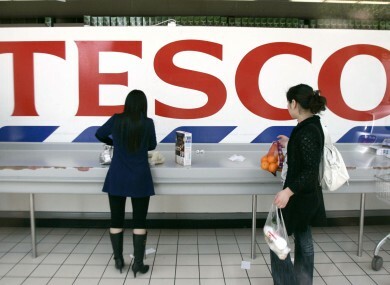 BRITISH SUPERMARKET GIANT Tesco has slowed its sales decline in Ireland, but its network here is still among the worst sales performers in the first three months of 2014. Like-for-like sales in Irish shops during the first quarter declined by 5.5 per cent, an improvement from the 6.4 per cent posted during the last quarter of 2013. The decline is the second worst among countries where the retailers has a presence, with only Slovakia posting a bigger decline. Tesco remains the largest grocery provider in Ireland, with 26.3 per cent of the market share of consumer spend in the first three months of the year. However, the store is facing stiff competition from German discounters such as Aldi and Lidl, which have grown to share 15.6 per cent of the customer spend at the end of April 2014. Tesco has been pushing through an aggressive discounting programme to keep pace with competitors. Overall, international sales increased by 0.5 per cent, with the grocer blaming currency impacts for a sales decline of 8 per cent overall. In the UK, losses in like-for-like sales accelerated to 3.7 per cent from 2.9 per cent at the tail-end of last year. Email “Tesco narrows Irish sales losses in 2014 - but performance is still down”. Feedback on “Tesco narrows Irish sales losses in 2014 - but performance is still down”.